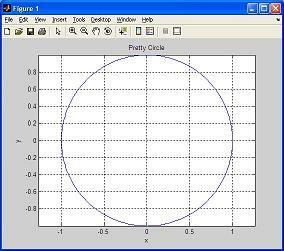 You'll learn to make simple MATLAB plots and print them out. This lesson teaches you the most basic graphic commands. If you end an instruction with ';', you will not see the output for that instruction. MATLAB keeps the results in memory until you let the results out. The arguments of the axis, title, xlabel, and ylabel commands are text strings. Text strings are entered within single quotes ('). Do you like your plot? Interesting and funny, isn't it?